Indian Foreign Affairs Minister Sushma Swaraj gestures during a press conference in New Delhi on Aug. 22, 2015. Pakistan called off high level talks with India Saturday night after the two sides traded barbs over the agenda. The national security advisers of India and Pakistan were to meet on Sunday and Monday in New Delhi. Instead, both are sticking to their own conditions for the meeting. India wanted the meeting to focus exclusively on terrorism. Pakistan wanted to discuss other issues as well, especially a regional territorial dispute over Kashmir that has been a bone of contention between the two countries since their independence from the British in 1947. The third partner was a reference to separatist leaders from parts of Kashmir under Indian administration. Pakistan had invited them to meet Aziz before talks with his Indian counter part. Last year, India cancelled talks between foreign secretaries of the two countries due to a similar meeting with Kashmiri leaders. Pakistan considers these leaders legitimate stakeholders in the Kashmir dispute and insists that meeting them regularly has been the norm for many years. India considers these meetings against the Shimla agreement — a document signed in 1972 which calls on both sides to settle their differences through “bilateral” negotiations. The NSA level meeting was a followup to an agreement the prime ministers of India and Pakistan reached last month in Ufa, Russia, on the sidelines of the Shanghai Cooperation Council summit. Both sides accused each other of trying to re-interpret that agreement and violating its spirit. “We were clear that if we say all outstanding issues then Kashmir is included... Ask anyone sitting here what is the biggest outstanding issue between the two countries, everybody will say Kashmir,” Aziz said referring to the joint communiqué issued at Ufa. 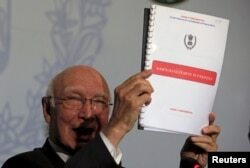 Advisor to Pakistan's PM on National Security and Foreign, Affairs Sartaj Aziz, shows dossiers allegedly on Indian intelligence agency's involvement in promoting terrorism in Pakistan, during a news conference at the Foreign Ministry in Islamabad, Aug. 22, 2015. “All outstanding issues will be discussed once violence and terrorism end. This meeting was supposed to discuss how to end those,” Swaraj retorted, adding that Aziz was only reading the preamble of the Ufa statement, not its operative part. They also traded accusations of dozens of instances of cross border firing at the Line of Control — the de facto border between Indian and Pakistani administered portions of Kashmir. Despite the hard hitting rhetoric, both kept the door open for future negotiations. “It is too early to tell whether the two prime ministers will meet” on the sidelines of the U.N. General Assembly session in New York next month, Aziz said, not ruling out a meeting outright. Swaraj, on the other hand, acknowledged that the relationship was difficult, but said the two sides have gotten over worse setbacks in the past. “In diplomacy, there’s never a full stop, only commas or semi-colons,” she said.